Whether to redesign the existing website or create a new one: website designs should convince. Websites should be welcoming, informative, well-arranged, and to the point – all factors that are highly influenced by layout and design. We conduct studies to early validate elements of design based on your target group, so that late costly surprises can be avoided. Thereby we are aiming at generating new clues and hypotheses for improvement, as well as finding objective arguments for design decisions. Based on these results, the optimization potential can be directly incorporated into the website designs in order to develop an optimal website. We are still working on this success story. Please come back soon and learn more about a successful eye tracking study in the context of website mockups. First, suitable test subject instructions are defined for the investigated website, so that participants of the target group are mentally prepared for a specific task. Due to the short field time these studies can be conducted anytime and repeatedly during an early phase to assist designers, developers, and decision makers. 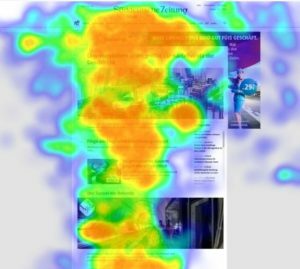 Eye tracking study of a website. You can book qualified participants right through the platform, as well as use your own existing pool of users or customers.